Cheap car hire in Paphos, Ayia Napa, Larnaca and Limassol. Why Car Hire in Cyprus? What's your ideal car hire experience? Pick up your luggage, collect your keys, hop in a clean, air-conditioned car with a full tank of petrol and hit the road? Then, car hire from Paphos airport must be your ideal car hire choice! See More With a Paphos Car Rental - Paphos Opens Its Doors! Car hire in Paphos gives you the freedom to be whatever you want to be on your Cyprus holiday: Romantic, cultured, eco-friendly, you name it! With your car rental, Paphos opens its doors so you can visit the famous Petra tou Romiou rock, where the goddess Aphrodite first step foot on earth. You can walk where Romans strolled on mosaic pavements in Kato Paphos (and park your rental car in the big car park nearby! ), or drive to see nesting sea turtles hatch by moonlight on deserted, golden beaches. There’s no better way to start your holiday than with dependable yet cheap car hire. At Paphos airport, you’re just 15-minutes from the uncrowded motorways of Paphos itself. With the freedom of your own car rental, Paphos is more accessible than you might think. No waiting for coaches, no queues for taxis and no expensive transfer costs. You get the fun of exploring Paphos your way, at your pace. What’s more, cheap car hire at Paphos airport is much less expensive than airport transfers. Used to picking up and delivering your own car rental? 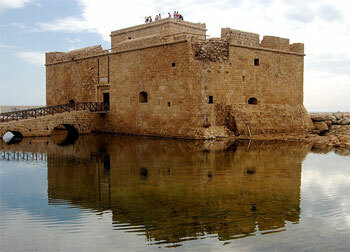 Paphos rentals from Cyprus Car Hire Portal are different. Just book your hire car from us at www.cyprus-car.com, and we'll deliver it to the airport, your hotel or apartment. Your car hire includes all delivery charges AND a full tank of petrol, so the minute you have the keys, you're ready to go! So, why not relax on the beach for a day or two, before hiring a rental car and heading out of Paphos to see the wonderful Cyprus countryside beyond? A Paphos rental car also gives you the freedom to explore the lesser-known parts of west Cyprus, from the pretty fishing port of Lakki to the vineyards in the hills beyond Coral Bay. With a Paphos car hire from us, You won't pay for a second named driver, so one of you can enjoy the free wine tastings offered to the full! Ready to book your car rental? Paphos is waiting for you. Click here to reserve your car hire in Cyprus now. Let us be your car rental service for Paphos, Larnaca, Limassol and Ayia Napa!